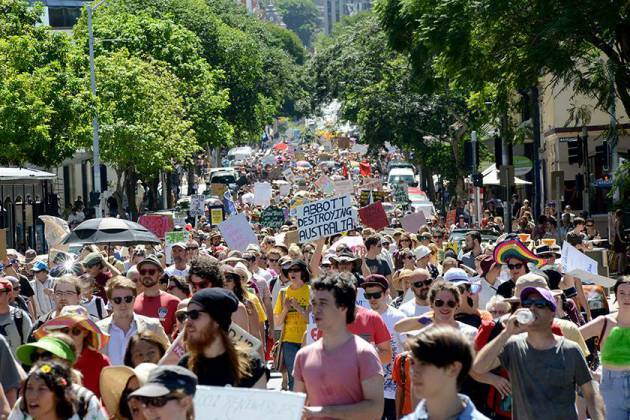 Over 8,000 protesters have rallied in Brisbane today against the Abbott government, in one of the biggest protests to hit the state in many years. A sea of passionate people flooded through the streets of Brisbane, expressing the notion that they are fed up with the current Prime Minister and his policies. The ‘March in March’ national protests stormed the country today, with over a dozen cities and regions following suite from yesterday’s strong beginnings. Sydney saw over 12,000, with Melbourne estimated at close to 20,000. Promoters have labeled the demonstrations a major victory, despite the lack of promotion or coverage from the mainstream establishment.